Tuireann wrote: I'm aware it's been tried but I've never tried it and it's not available. I'm curious what about it does not work. Access to Tablut T cross 11x11 is opened, so that Tuireann can study its shortcomings. Sigurd and Tuireann asked about the "Nielsen layout". The "Nielsen" setups are natural extensions of board setups from 11x11 into boards 13x13 and 15x15. Hagbard wrote: Access to Tablut T cross 11x11 is opened, so that Tuireann can study its shortcomings. Thanks for giving me access to it. 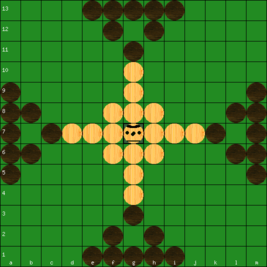 Having completed 3 of my 4 T cross games I see there are a severe lack of viable openings for white to exploit. Or at least none that I can see. Black seems to have an epic advantage blocking anything white tries to do to get out and create a gap. 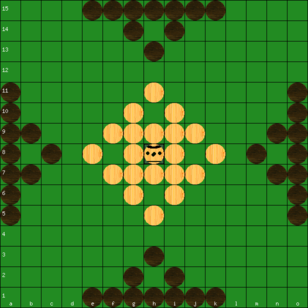 Tuireann wrote: Having completed 3 of my 4 T cross games I see there are a severe lack of viable openings for white to exploit. Or at least none that I can see. Black seems to have an epic advantage blocking anything white tries to do to get out and create a gap. Yes the game balance was measured -1.60, 160 black wins to 100 white wins. Xerxes wrote: Does this include Tournament games ? If so it will be biased towards those game types for which you have run competitions ! Yes, both championship and test tournaments. However, only variants which were found to work, are counted. Fx. ten tawlbwrdd setups were tested, but only three worked fine, and the rest are not counted. 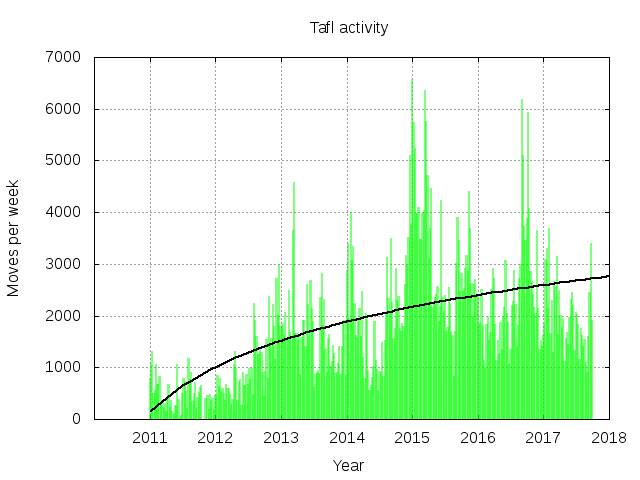 This diagram shows the tafl gaming activity of the latest seven years of this site, measured as number of tafl moves done per week. Throughout 2012 the gaming activity growth was exponential, but now the overall growth is more like logarithmic. The average activity is at the moment about 400 game moves per day. However, the gaming activity of the new site Play Tafl Online should be added to these numbers to get the actual internet tafl activity.